Disney Princess is one of the most popular girl's party themes. It's also popular with parents because it is a very easy party to organise. The wide availability of Disney Princess party products means that a lot of the work has been done for you, and if all else fails you can put on a Disney Princess movie. Scroll down the page for themed party products and party ideas. The eight Disney Princesses are Snow White, Cinderella, Aurora, Ariel, Belle, Jasmine, Pocahontas, and Mulan. Yogee Toys – Sydney based toy shop with a huge range of brand name and licensed toys. 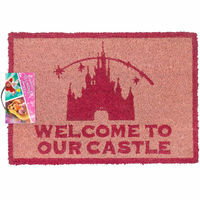 See their range of licensed Disney Princess products. Costume Box – Thousands of fancy dress costumes for everyone, from infants to adults, for all occasions. Search for their favourite Princess or browse girl's Fairy and Princess costumes, including official Disney costumes. Based in Sydney with flat rate delivery Australia wide. Party Products Australia – Balloons, decorations and party favours with a Disney Princess theme. Based in Brisbane with flat rate delivery Australia wide. Here are some simple activities and party games to make your Princess party a right royal success. All these activities can be done indoors if the weather is bad. Makeovers – when the guests arrive do their makeup, nails and hair, and have some simple dress-up items like tulle skirts available. Make princess hats from regular cone party hats and craft products. Play ‘Pin the Crown on the Princess'. Watch a Disney Princess movie. Princess treasure hunt: hide small cardboard cut-outs of crowns, glass slippers, poisoned apples and castles. Hide one of each item for each guest (and a few extras). Draw up lists of all the items and get the guests to find the items on their list. Food with a princess theme is fairly easy to make, giving normal party fare an extra girlie twist usually suffices. You can get away with nearly anything if it is coloured pink, purple, white or pale yellow. Make a cake shaped like a castle using a square cake and jam rolls for towers. Cupcakes with pink or lavender icing. Dust with multi-coloured sprinkles or silver dragées/cachous (little edible balls). Make the party a ‘tea party' by pouring drinks from a teapot. Fruit platters. If you are feeling ambitious you can cut thinly sliced fruit into crown, heart and star shapes using cookie cutters. Fun to Learn Disney's Princess is an early-learning magazine which brings together Disney favorites such as Ariel from The Little Mermaid, Belle from Beauty & The Beast, Aurora from Sleeping Beauty, Snow White, Cinderella, Mulan, Jasmine from Aladdin, and Pochahantas. Each issue is full of magical stories, a collectible poster, a Princess project, and a pull-out workbook full of fun activities. It's great for any princess, aged 4 and up.